Notes: Although it wasn't without its highlights, week 6 was on the whole decidedly quieter than expected, given the pace of activity in recent weeks. 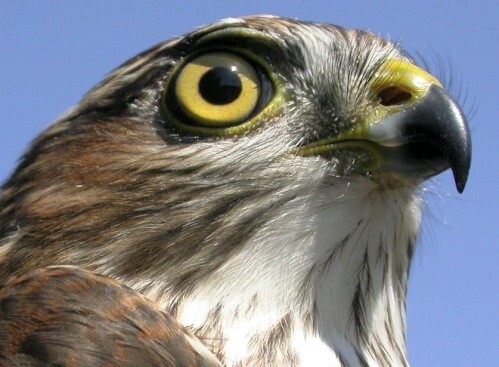 Though we banded all seven days, we added fewer than 200 birds to the season total, and on three days couldn't even manage to get to 20 for the morning. 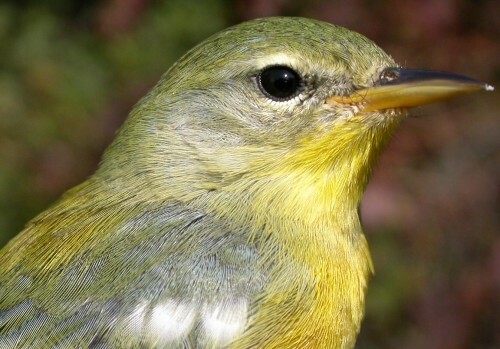 It seemed that the mixed warbler flocks dominated by Magnolias largely left last weekend, and the next big wave of migrants hadn't yet arrived. Given the above-seasonal temperatures for several days this week, that's not too surprising. Fortunately, new arrivals began trickling in on Saturday after the coldest night of the fall to date, and Sunday saw a noticeable increase in both species and individuals. Whereas Magnolia Warbler and Red-eyed Vireo were the species which best characterized Week 5, this week it was Palm Warbler and White-throated Sparrow which dominated (setting aside the enormous flock of Common Grackles, varying daily from 260 to 750 individuals). The Palm Warbler was particularly interesting, as there are two visibly recognizable races which occur here - the Western (whitish below) with a distribution across much of the Canadian boreal forest and the Yellow (yes, yellowish below) largely restricted to Quebec. The first several Palm Warblers we observed were all Western, but then on Thursday we had our first few Yellow, and since then those have been the most frequently observed. The Fall 2005 list of species observed grew substantially this week, with 12 new arrivals. Most notable were Broad-winged Hawk, seen migrating in good numbers on Sunday (37 birds), early Golden-crowned Kinglets and Brown Creepers, and our first ever American Pipits flying overhead. The others were Common Loon, Double-crested Cormorant, Yellow-bellied Sapsucker, Northern Rough-winged Swallow, Winter Wren, Wood Thrush, Lincoln's Sparrow, and Rusty Blackbird. The Fall 2005 banding list also grew nicely, with 7 additions. Monday's Winter Wren and Sunday's Northern Parula were firsts for MBO, bringing the cumulative list of species banded to 90. Most of this week's other new species were also ones we have had only occasionally in the past: Sharp-shinned Hawk (3 previously), Golden-crowned Kinglet (5), Brown Creeper (6), Scarlet Tanager (2), and Common Grackle (30). Other highlights this week included recaptures of a Black-capped Chickadee and a Song Sparrow each banded during our first few days of operation last September. Contrary to last week's predictions, Rose-breasted Grosbeaks and Ruby-throated Hummingbirds have continued to be seen almost daily this week, although usually only one or two individuals per day. The hummingbirds have continued to entertain us, with one hovering for a while beside one of our red bird bags hanging on a branch, and another determinedly pursuing a crow. Also to our surprise, we saw a wider variety of species this week than last, with a total of 85 observed even though the most we had on any single day was 50 on Sunday. Aside from the birds, we had a couple of other perplexing sightings this week. Several giant puffball mushrooms were spotted along the census trail, the largest of them over 40 cm in diameter. None had been seen while smaller though, indicating they must have grown very quickly, as they were in rather conspicuous locations. Even more mysterious, we found 6 dead moles (5 starnosed and 1 hairytail) and 3 dead shrews, all lying on the trails, and most of them without any visible wounds.